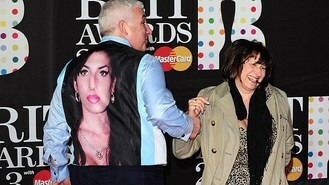 Mitch Winehouse was attending the event at London's O2 Arena to represent his daughter - who died in 2011 - after she was given a posthumous nomination for best British female. Many stars were happy to flash the flesh as they took to the red carpet, despite temperatures plunging as low as the necklines. Singer Jessie J wore a daring black dress with a v-shaped front which dipped almost to her navel and former X Factor star Rebecca Ferguson showed off her legs with a thigh-length split in her gown. US superstar Taylor Swift, who is among tonight's performers, had bare arms and sheer panels in her dress to show off her legs as she arrived for the bash, and happily posed for photos with fans. One guest who was in line for a late arrival was Lily Allen who sent a message on Twitter explaining that she had headed to the wrong venue. She had mistakenly headed to west London's Earls Court, which had been the home to the event for many years before it headed east to Greenwich. The singer told her fans: "Oh according to my driver the Brits 2013 are no longer at Earls Court - this should only delay me by another hour or so. Whoops." The arrival of chart stars One Direction brought screams from fans. The group's Louis Tomlinson told Sky News: "We've very excited to be back here." And talking about the huge impact the group have had in the US, his bandmate Liam Payne said: "We don't stop to think about it - but when you think about it, it is mental." Guests also included Bond girl Berenice Marlohe who arrived in a ruched floor-length silver gown and bare shoulders. Many of the male stars opted for more formal attire with Robbie Williams and Conor Maynard both arriving in suits.